I had no idea how easy it was to make fruit chips… but man. If you have extra fruit kicking around or a bumpercrop of whatever is in season, this is totally the way to go! I’m kinda addicted- and the snacks last for ever in the fridge! Sooooo easy. And the flavour is super concentrated, so you get a terrific burst, especially if you add them to baking (mm..in muffins! or loafs! or cookies! ), or to oatmeal or to your breakfast cereal… the possibilities are endless…. Funny enough, the most un-pretty is the one I really love- the banana. Wow. Does it ever make you want to eat more and more…. perfectly sweet and slightly chewy/crispy. Delicious. The trick to these is to slice them really thinly, and lay them on parchment paper on a cookie sheet in your oven. The more watery the fruit, the longer it will take. So, for apples, 2 hours, but for strawberries, 2.5 hours. And you don’t need a dehydrator! NOTE: I’m thinking this would be a terrific starting point for making fruit leather… pureeing some peaches and adding lemon juice, spreading it on the cookie sheet… I wonder how that would turn out… or strawberries now that they are in season…. couldn’t you imagine some strawberry rhubarb fruit leather? That would be super. OK, back to fruit chips here! They are a terrific way less guilty snack! 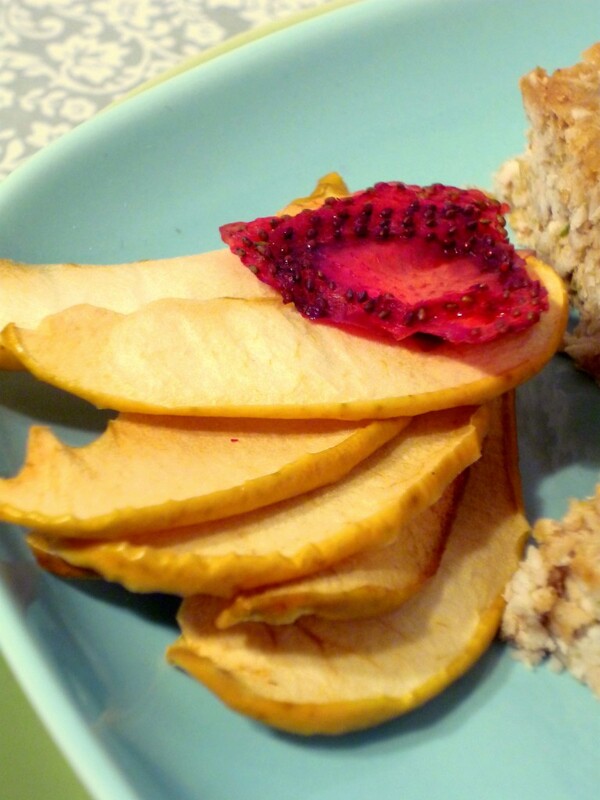 Slice the fruit as thinly as you can, and lay on top of a parchment paper covered cookie sheet. “Dry” in your oven at its lowest setting or at 200 degrees, for about 2 hours Raw food: use your dehydrator. The strawberries may take the longest, check periodically. You may need to increase the amount of time. When they are ready, peel off the parchment paper, and place in a container in the fridge. They last for weeks and weeks!